Graham Ford, the coach of the Natal Dolphins, believes that Kevin Pietersen's forthcoming stint in South Africa will be hugely beneficial for both the club and the player, as Pietersen seeks to rediscover his form ahead of this winter's Ashes campaign. But Ford denied there was any special significance in KP's return to a club from which he departed in controversial circumstances more than a decade ago, insisting that the issues that had persuaded him to seek his fortune in England were no longer relevant in the new South Africa. Although Pietersen has a reputation for falling out with his clubs and coaches, following high-profile departures from Natal, Nottinghamshire and most recently Hampshire, Ford is one of a handful of mentors with whom he has never had any issues. Both men were born in Pietermaritzburg, where Ford was Pietersen's coach in his high-school days, and in his autobiography, Pietersen described him as a man "I both respect and admire". In 1999, when he threw in his lot with South African cricket in the belief that his opportunities were being held back by affirmative action, Ford was one of the few people who actively attempted to dissuade him from such a drastic course of action. "People are dying to see him, and they can't stop talking about the fact he's coming, so I think all those issues are in the past now," Ford told ESPNcricinfo's Switch Hit podcast. "South Africa as a country has absolutely blossomed and developed - we saw that at the [football] World Cup - and issues that were seen as issues 10 or 12 years ago are not issues anymore. The country has become so united and no-one's bothered by the past, so I think it's more now about the cricket now. "I did coach him when he was a young kid through to his final years of high school, and I've always stayed in touch and followed his progress," added Ford. "He's still got links to his school in Pietermaritzburg, and the people there are very proud of what he's achieved, even though he's playing for a foreign country. Those issues are dead and buried in the past. A lot of people will be watching and hoping that he has a bumper series in the Ashes." Despite his initial anger at being dropped by England and told to rediscover his form in domestic first-class cricket - as telegraphed in the expletive-laden Twitter post that earned him a fine from the England & Wales Cricket Board - Pietersen was quickly persuaded of the merits of the decision, and Ford confirmed that the initial approach to play for the Dolphins had come from the player himself. "He pretty much put it to me," said Ford. "Obviously we've been in contact quite a bit, and he's keen to put in some quality work out here, to get a couple of games with some good quality match time, and get in good touch ahead of the Ashes. He's had limited game-time over there [in England] with Hampshire not using him, but with his sort of talent and a bit of decent match time, if he gets his form back, the Aussies better watch out." Pietersen is likely to play in two first-class fixtures during his stint with the Dolphins, against the Warriors from October 7 to 10, and against the Titans from October 14 to 17, and with three first-team players - Hashim Amla, David Miller and Loots Bosman - likely to be away with the national squad at that time, Ford was especially pleased with the timing of his arrival. "It's a win-win for us," he said. "There will be a couple of gaps in our batting line-up, so it works out perfectly for us to get him involved. It's a great chance for him to prepare for the Ashes, but we want to make use of his knowledge and skills. It'll be great for our squad to rub shoulders with him, and get a great deal of info and advice from a player who's played all round the world with a great deal of coaches at all sorts of levels. The kind of knowledge he has will be huge for all of us, players and coaches included." Pietersen's apparently prickly nature has left a trail of disputes and falling-outs in his wake, not least at England level where his feud with Peter Moores in January 2009 caused the removal of both men as captain and coach respectively. However, Ford insisted that some allowance had to be made for men with the talent and desire that Pietersen has shown throughout his career, and added that it was up to the management to channel that drive in a direction that was beneficial to the team as a whole. "I worked with him as a young fellow, and he's obviously had a few hiccups here and there with a few people, but generally he's a very competitive guy and a positive guy," said Ford. "Initially when he took over the England captaincy he had a very positive effect on English cricket, because he's one of those strong characters who leads from the front. If you are really going to be a top sportsman at that sort of level, you do need to be a strong character and you do need to have a bit of controlled arrogance, a real self-belief that you can go out and do the job. "Sometimes those kind of characters can cause a few problems, and there can be a few clashes, but mostly if they are managed well, guys like that can be more positive in the camp than negative," he added. "You want to try and keep those sorts of characters going. If England can get the best out of Kevin, they've got a real chance of winning the Ashes." Ford also believed that Pietersen's current downturn in form, in which he hasn't scored an international century since March 2009, was sure to come to an end sooner rather than later. "I think he's such a talent, it's just a matter of allowing that talent to sort itself out," he said. "With real good players, if they do enough work at the right intensity, the body finds ways to sort its problems out. "I don't see any major technical issues, it's just important to have some quality practice and a couple of good knocks in the middle, as opposed to indoor work in England. I guess a fresh scene and the chance to link up with old friends and family can only be good from a psychological aspect, but think for England's sake, the great news is that this guy is dead-set on getting back to the levels that he can produce." 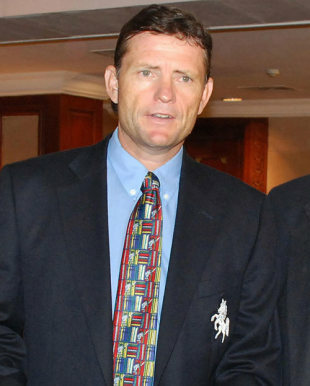 Around the time of the Pietersen-Moores debacle, Ford - who was at the time head coach at Kent - was a strong front-runner for the job of England head coach, not least because of his renowned rapport with Pietersen. However, two years down the line, he insisted that he had never been as interested in the job as had been made out at the time. "I'm passionate about the game of cricket, I was pretty involved in the English game back then, and I still follow it closely because I really felt a part of it at the time," he said. "But to take on a role as high-profile as that would have pretty much been the end of my family life. It would have been a huge decision. A big part of me would have loved to get involved, but a big part of me was saying it's not the right time."